FIGURE 1.9 Exposed rocks in Antarctica. 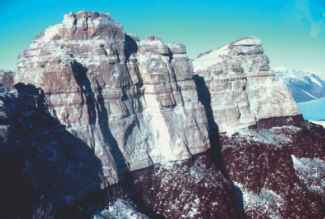 Zone of dark red rocks are volcanic and lack fossil plants, including microfossils. through a levee, a rush of water and sediment, called a splay deposit, can rapidly cover the adjacent floodplain, inundating the plants growing there. Associated with the deltaic system are abandoned stream channels, often referred to as oxbow lakes, and vegetation growing along the banks of these abandoned channels may be undisturbed for some time. If a subsequent flood destroys the levee, knocking down trees and other plants growing on it, these plant parts can be carried to abandoned channels and other places where a high concentration of sediment would bury the plant fragments and fill in the oxbow. As might be expected, plant parts carried for great distances would tend to be fragmented and shredded, and those deposited close to the place of growth would be less distorted and better preserved. Plants that become preserved at the same locality where they were growing are termed autochthonous (e.g., many Pennsylvanian coal ball deposits), whereas those assemblages that have been transported are termed allochthonous. Preservation of whole plants or plant parts (usually stems and roots) in growth position is termed in situ. FIGURE 1.10 Cuticle preparation of the seed fern Blanzyopteris praedentata showing numerous trichomes extending from the surface. Bar = 1mm. it) as it is converted into rock (Gastaldo, 1989; Gee and Gastaldo, 2005). FIGURE 1.11 Multicellular, uniseriate trichomes on Blanzyopteris praedentata cuticle. Bar = 400 ^m. covering on leaves), or the molecules that remain part of the leaf after diagenesis (geochemistry). It is possible to determine the proportion of carbon isotopes (13C versus 12C) in many fossil plants, and to use these to reconstruct paleoenvironment or the type of photosynthetic pathway (C3 versus C4 photosynthesis) employed by the plant. And in the future? Perhaps paleobotanists will be able to extract information that reveals details about biochemical pathways, developmental mechanisms, and families of genes involved in response to parasites or herbivores that attacked the leaf surface, all from a fossil plant leaf! 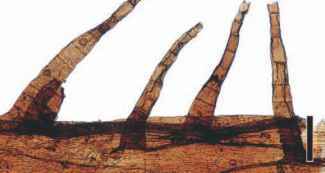 Although there are numerous variations on the ways in which plant fossils are preserved, there are a few basic types which we discuss later. 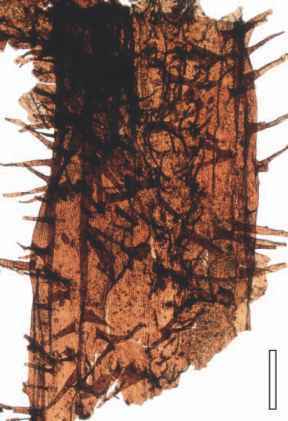 It is important to keep in mind, however, that all preservation types can intergrade, or a fossil plant may be preserved in more than one way, for example, a compressed plant with a stem that is partially petrified. Finally, there may be certain structures that appear to be an organism, but are not of organic origin. 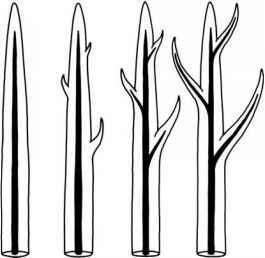 One of the most common of these are dendrites (FIG. 1.12). What is plant depositional plant?